The most recent American Community Survey (ACS) data show that, including self-employed, 10.3 million people worked in construction in 2017. NAHB estimates that out of this total, more than 4 million people worked in residential construction, accounting for 2.6% of the US employed civilian labor force. These numbers reflect steady job gains that took place since 2011 when construction employment bottomed out. Nevertheless, the industry employment levels remain below the peaks reached during the housing boom when more than 11 million worked in construction, and home building employed more than 5 million people, including self-employed workers. NAHB estimates also allow analyzing the distribution of home building jobs across states and congressional districts. Congressional district estimates are particularly useful to highlight the importance of home building to voting constituency residing in the district. The NAHB estimates show that the average congressional district has about 9,300 residents working in residential construction but that number is often significantly higher. In Montana’s single Congressional district, over 21,000 residents are in home building. Arizona’s 7th and Idaho’s 1st are close second and third districts with over 20,000 residents working in residential construction. New NAHB residential construction employment estimates only include workers directly employed by the industry and do not count additional jobs created when building material suppliers, furniture producers, landscaping and other dependent industries hire workers in response to shifting demand for their products and services triggered by residential construction. 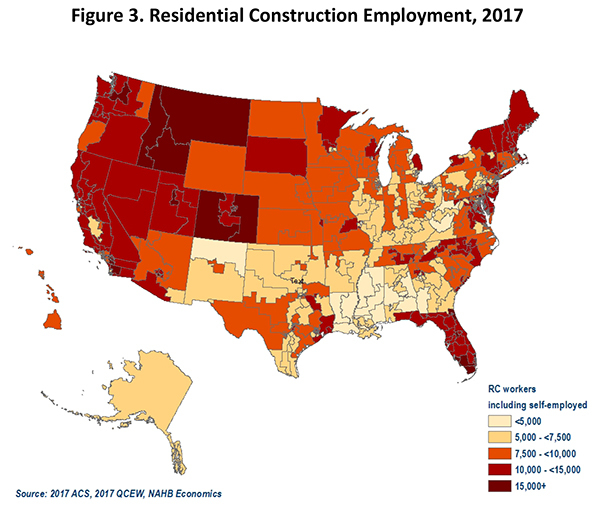 NAHB estimates of residential construction employment by state and congressional district rely on the two main sources of data: the American Community Survey from the US Census Bureau and the Quarterly Census of Employment and Wages (QCEW) compiled by the U.S. Bureau of Labor Statistics (BLS). The ACS surveys households rather than businesses and, consequently, covers self-employed workers in addition to workers employed by private companies, government and non-profit groups. Because of this broader employment definition, the ACS employment numbers exceed the estimates based on surveys of businesses with payroll employees, such as the QCEW, but count voting constituencies and reflect the political importance of home building more accurately. In addition, the ACS employment estimates are available not only by state and metro area but also by congressional district, something that no other employment data source can offer. Counting self-employed is particularly important in the construction industry where they traditionally make up a larger share of the labor force. In fact, the construction sector registers one of the highest shares of self-employed among all industries. According to the 2017 ACS, 23.5% of construction workers are self-employed, while the economy-wide average is below 10% of the employed labor force. The drawback of the ACS is its limited construction industry information, particularly, it does not differentiate between residential and non-residential construction. In contrast, the Quarterly Census of Employment and Wages data specify whether employees work in commercial or residential building. Furthermore, the QCEW differentiates between residential building construction, land subdivision and residential specialty trade contractors. The QCEW data come from quarterly tax reports filed by employers covered by various unemployment insurance programs, and, in essence, amounts to a “virtual census” of businesses with payroll employees. However, it completely misses self-employed workers. 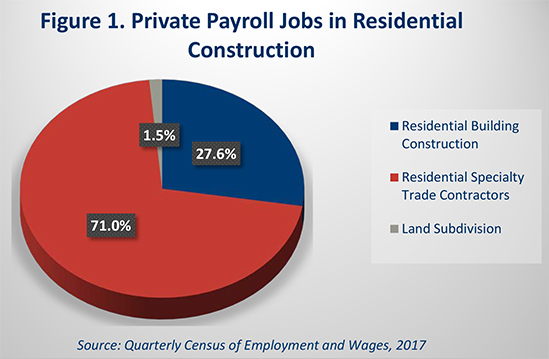 The 2017 QCEW data show that residential specialty trade contractors account for close to 71% of all private payroll jobs in the home building industry (see Figure 1). This is consistent with a 2015 NAHB survey showing that two thirds of single-family builders subcontract out at least 75% of their work. Residential building construction (which includes single-family and multifamily builders, whether they build on their own land or land owned by a homeowner or investor, and residential remodelers) accounts for 27.6%. The remaining 1.5% is in land subdivision. To account for self-employed workers and, at the same time, have access to the detailed industry structure information, NAHB Economics combines data from the ACS and QCEW. First, the share of residential construction is estimated for each state based on the QCEW data. Residential building construction, residential specialty trade contractors and land subdivision are combined to form “residential construction”, or “home building”. The resultant state shares are then applied to the ACS data to break construction workers into residential and non-residential. The estimates assume that, within each state, the share of construction workers who work in the home building industry is the same whether they are self-employed or working as employees of a construction company. This, probably, results in a somewhat conservative estimate, because the self-employed share in residential construction, especially, in remodeling, is likely to be greater than in non-residential. The 2017 ACS shows that 10.3 million workers were employed in the construction industry in 2017. This is still 0.9 million fewer jobs than in 2006, at the peak of the housing boom. Nevertheless, it represents six consecutive years of steady job gains (see Figure 2). The ACS data also highlight the high reliance of the industry on self-employed workers. Out of 10.3 million construction workers, 23.5% (2.4 million) are self-employed while the economy-wide average is below 10%. The high self-employment rates in construction reflect a common practice of builders and remodelers to maintain relatively small payrolls and rely on subcontractors for a large share of the construction work. During the housing downturn, construction self-employment increased from 24% in 2006 to more than 26% in 2010. Once the situation stabilized and construction started gaining jobs, the self-employment rates reversed their course in 2011 and fell close to 23% in recent years (see Figure 2). During the downturn builders and remodelers who were no longer able to maintain a steady work flow may have tried to manage costs by eliminating payroll positions and joining the ranks of the self-employed. It is also possible that some construction employees laid off during the downturn were able to stay in the industry by striking out on their own. The share of self-employed workers in construction peaked in 2010, exceeding 26%. The opposite hiring trends emerged once the housing industry started its slow climb out of the cyclical trough. The construction industry has been adding payroll jobs since 2011, while the number of self-employed construction workers continued dwindling until 2015. 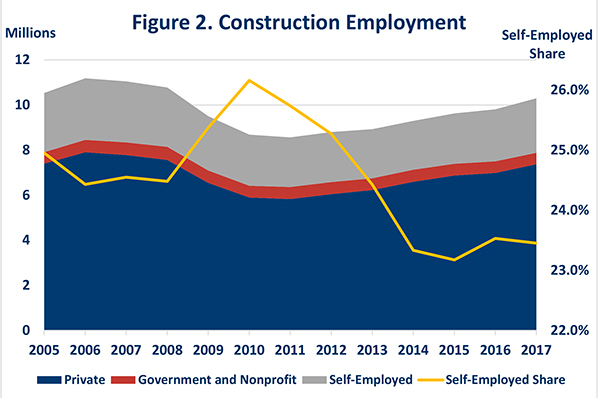 The ACS data show that from 2011 to 2017, construction gained over 1.5 million (26%) private payroll jobs but the pool of self-employed workers grew by about 200,000 (10%). This helps explain why builders have reported more extreme labor and subcontractor shortages than commonly cited numbers based only on payroll employment suggest. Source: American Community Survey, 2005-2017. NAHB estimates that, out of 10.3 million people working in construction in 2017, more than 4 million people worked in residential construction, accounting for 2.6% of the US employed civilian labor force. This represents the sixth consecutive year of modest employment gains for home building. However, the number of residential construction jobs remains below the peak levels the industry reached in 2006 when, according to the NAHB estimates, more than 5 million people worked in residential construction. Not surprisingly, the most populous state—California—also has the most residential construction workers. Over 586,000 California residents worked in home building in 2017, accounting for over 3.1% of the state employed labor force. Both numbers are still significantly down from the 2006 cyclical peak. At that time, California was home to over 788 thousand residential construction workers. A decade later, over 200,000 home building jobs are still gone. Despite being one of the states most severely affected by the housing downturn, Florida comes in second with close to 380,000 residential construction workers (still unable to restore close to a third of homebuilding jobs compared to the 2006 levels). Florida has fewer residents than Texas and about as many as New York but owing to its large vacation and seasonal housing stock, employs more residential construction workers. In Florida, residential construction workers account for a relatively high 4.0% of the employed state labor. Even though this share is well above the national average (2.5%), it is drastically lower than in 2006 when Florida registered the highest share among all 50 states and the District of Columbia, 6.5%. Among the states hardest hit by the housing downturn and slowest to recover home building jobs are New Mexico, Nevada, Arizona and still showing job losses of 50, 39, and 38%, respectively, compared to 2006. Despite these significant job losses, home building in Nevada and Arizona continues to employ a relatively high share of local workers – more than 3.2 and 3.3% of the employed civilian labor force, respectively. Many of these states, where home building accounts for a higher share of the labor force, also register higher shares of self-employed. Notably, Montana and Vermont have the highest shares of self-employed construction workers in the nation, 39% and 35%, respectively. In Maine, more than a third of the construction workforce is self-employed. The New England states are where it takes the longest time to build a house. Because of the short construction season and longer times to complete a project, specialty trade contractors in these states have fewer workers on their payrolls. As a result, a greater share of work is done by independent entrepreneurs, thus explaining high self-employment shares in these states that go together with elevated shares of residential construction workers in local labor force. The detailed geographic coverage in the ACS also allows RC employment to be estimated by Congressional district (see Table 2). In 2017, the average Congressional district had around 9,300 residents working in residential construction, still down from the average of more than 11,000 workers in 2005. Figure 3 helps visualize the distribution of RC workers across the Congressional districts. Many areas that were once booming and consequently hardest hit by the housing downturn still show higher than average numbers and shares of residential construction workers. Montana’s lone Congressional district (Rep. Greg Gianforte – R) registers the record number of residential construction workers among all districts, over 21,000. Arizona 7th (Rep. Ruben Gallego – D) that includes much of inner Phoenix and Idaho’s 1st (Rep. Russ Fulcher – R) that comprises the western part of the state are close second and third with close to 21,000 residents employed in home building. Colorado’s 7 (Rep. Ed Perlmutter – D) that encompasses parts of the Denver-Aurora metro area is next with just over 19,000 residential construction workers residing there. Next on the list are three congressional districts in Florida with close to 19,000 residents working in home building. Florida’s 25th (Rep. Mario Díaz-Balart – R) stretches from west of Miami to east of Naples and Marco Island. Florida’s 19 (Rep. Francis Rooney – R) serves an area on the west coast of Florida from Fort Myers to Marco Island). Florida’s 10th (Rep. Val Demings – D) is inside Orange County and includes parts of Orlando, Winter garden. Texas’s 33rd (Rep. Marc Veasey - D) that includes parts of Dallas and Fort Worth and Florida’s 26th (Rep. Debbie Mucarsel-Powell - D) in far South Florida have close to 18,000 residential construction workers. Colorado’s 3rd (Rep. Scott Tipton - R) that includes the cities of Grand Junction, Durango and Pueblo concludes the top ten list with close 17,500 residents working in home building. The new estimates show that despite losing thousands of jobs during the housing downturn, the home building industry employs a substantial number of workers in most parts of the country. The average Congressional district has about 9,300 residents working in residential construction but the number can be twice as high or higher, and exceeds 21,000 in Montana’s At-Large Congressional District. Considering that the estimates only include workers directly employed by the industry and do not count jobs created in related industries– such as design and architecture, furniture making, building materials, landscaping, etc. - the true impact of residential construction on local employment is underestimated. The 2012 Economic Census data show that specialty trade contractors in Montana, Maine, Rhode Island, Vermont, Idaho, New Hampshire have the smallest payrolls in the nation with 5 to 6 workers, on average. Whereas, the national average is close to 9 workers.